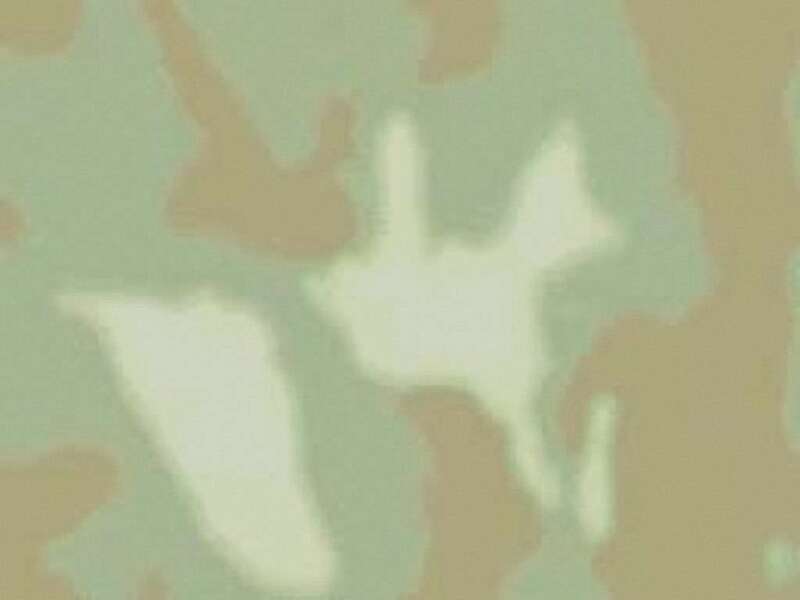 Any Soldier Inc. ... Help! We have a Vehicle Donation Program with Car Program LLC! You can donate any vehicle and help not only Any Soldier Inc. but also get a tax break for yourself! We work with a reputable car donation processor, Car Program, who will make all the arrangements at no cost to you. They handle the title transfer requirements and will provide you with a tax deductible donation receipt when they pick-up your car. Need more information? Click HERE to donate your car and a helpful representative will call you shortly or you may call our car donation program 24/7 at 1-800-240-0160. HOT!!! Developed by Any Sailor® supporters at MIT in cooperation with Yahoo!®, we present the Any Sailor® Toolbar! This toolbar runs on your browser, is completely free, and everytime you use the search bar on it Any Sailor® gets a few cents. Learn more about it and get it now, FREE, HERE. Anyone in the Federal Government and Military can contribute to Any Soldier Inc. Please help spread the word on this. Thank you, very much, for your support! Any Soldier Inc. is proud to be one of them! Please note that we are also approved for IBM ECCC, listed under the state of Maryland, with IBM agency code: 0N683. (That's a leading zero, not an Oscar). AND...Any Soldier Inc. has partnered with CharitableHotels.org, the first non-profit online travel agency (OTA) in the country. CharitableHotels.org offers travelers the same hotels and the same rates as other OTA's like Expedia and Hotels.com but instead of keeping the commission, they donate it, less their costs, to the charity of the traveler's choice. Although most travelers now book their own hotel online, the hotel still pays a sizable commission to the OTA. Charitable Hotels is changing the game by doing something good with that commission - giving it to a good cause - instead of growing their bottom line. And now Any Soldier Inc., as a Partner Charity, is eligible to receive the donation. Shop online at Amazon.com HERE. Shop the web and help Any Soldier Inc! Simply enter "any soldier" in the "Who do you support?" 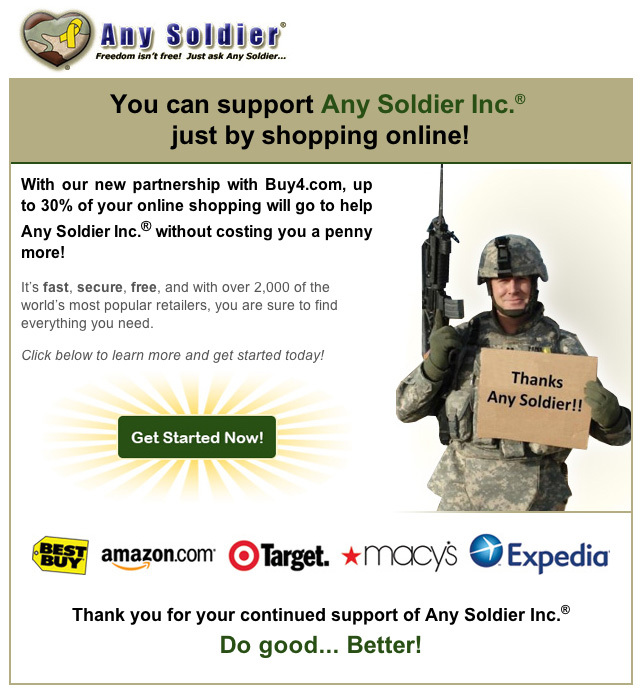 box and then select "Any Soldier - AnySoldier (Waldorf, MD)", then click on any of the many shops associated who will donate a portion of sales to Any Soldier Inc.
JustGive.org celebrates 10 years of online charitable giving! We're honored to partner with Any Soldier Inc. on this journey: Giving hope and help to many in need. To mark the occasion, thank donors and further our mission to increase charitable giving, starting October 10, we'll add $10 to every donation made for 10 days. A single donation from each donor will qualify for the additional $10 from JustGive. Donations as small as $10 are accepted. Click HERE! Any Soldier Inc. is now participating in Pick'n Save's electronic "We Care" community dollar donation program. Any Soldier® benefits if you list Any Soldier's organization number on your Advantage Plus Savers Club Card application. Our Account Number is 029800. Then, everytime you present your Pick'n Save Advantage Card at the checkout, a donation from that grocery purchase is added to Any Soldier's account. The more Pick'n Save customers with Any Soldier's account number assigned to your card, the larger your donation. Recycle your cell phones, PDAs, iPods, laptops, digital cameras, inkjet and laser cartridges, DVD movies, GPS devices, video games and video game consoles to benefit Any Soldier Inc. Click HERE to enroll and get free shipping labels, or contact Recycle for Soldiers at 877-790-1870. Already enrolled and need more labels? Click HERE. Be sure to put "Any Soldier" somewhere on the label!! We are awarding participants an additional $50 if we receive 10 iPhones on their behalf. I wanted to contact you as I see cell phones come in on your behalf fairly frequently. Several of our other participants have had good luck with the iPhone promotion, since there are so many out there now after the 4th generation model was released. We are paying up to $225 per phone and I thought it might be something worth advertising on your website. Donations are tax deductible, Any Soldier Inc. is a 501(c)(3) organization.